Over the years I have tried to photograph as many different classes of locomotive and unit as possible at work on the Cotswold Line, especially my local bit of it between Wolvercote Junction and Moreton-in-Marsh. 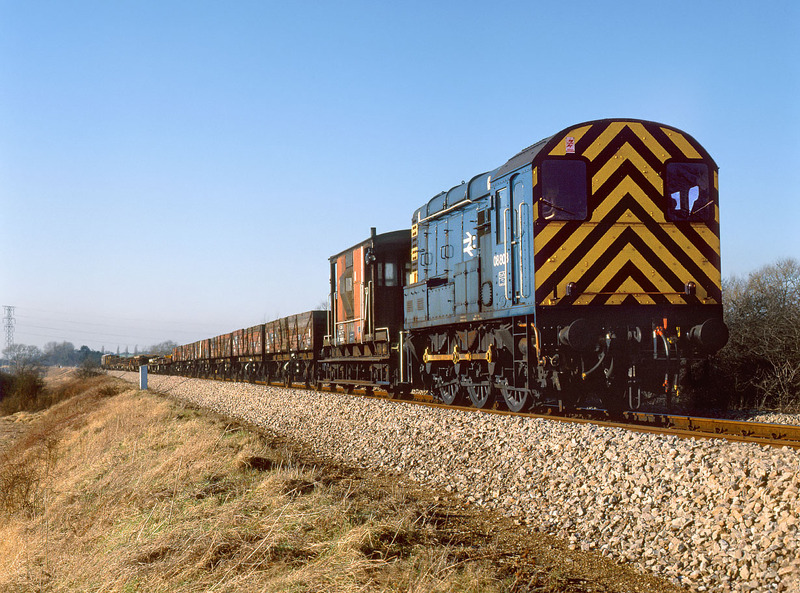 One of the more unusual classes to be used in recent years is the humble Class 08 0-6-0 shunter. Here, regular Oxford loco 08803 trundles along at its maximum speed of 15 mph with a lengthy engineer's train from a track relaying possession at Hanborough, heading back to Hinksey Yard on Sunday 26 January 1986. Presumably the seven miles of main line running was not seen as a problem, or else there was no more suitable loco available. The location is between the site of Yarnton Junction and Wolvercote Junction.